Spacious, grass pitches enjoy great vistas across the adjacent fields to where the hills rise and fall. Kestrel Lodge's policy is 'pitch where you like, leaving as much space between others.' 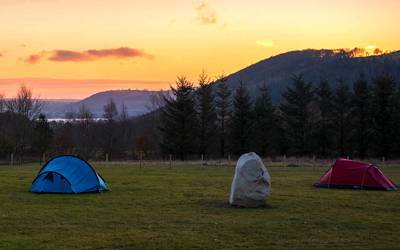 The site also boasts hot showers, WiFi, and allows campfires - as we know there is nothing nicer than relaxing around a roaring fire underneath the stars after a busy day out on the fells! Louise Smith and Andrea Bramhall seem to have found a winning formula – find an old farm in the most enviable location you can think of, give it a good make-over with a lawn-mower, a few sign posts and a spanking new block of modern showers, then open up the gates and let the campers roll in! Their first campsite in North Norfolk – that they took over almost 10 years ago – received a solid two thumbs up from all the Cool Camping clan – and we very much expect it to be exactly the same at Kestrel Lodge. After all, if they were on to a winner the first time, we think they may just have topped it here! 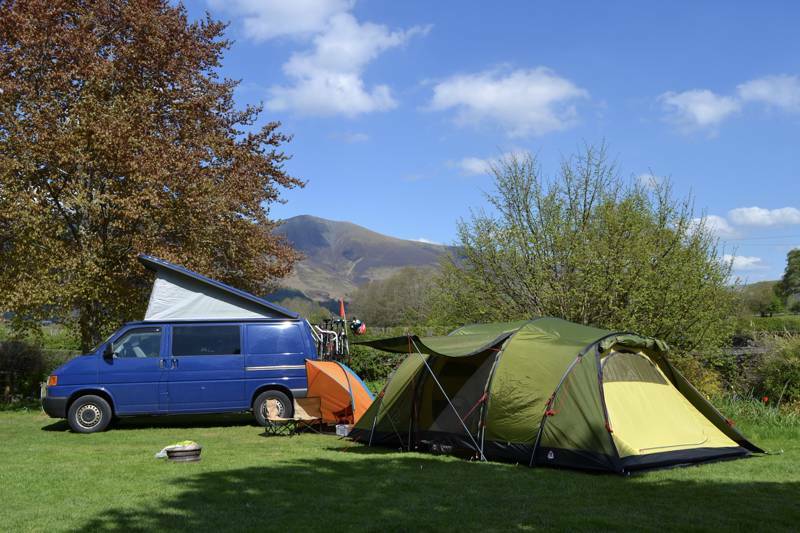 Set in the shadow of mighty Skiddaw, climbing away to the south east, and a stone’s throw from sparkling Bassenthwaite Lake to the south west, Kestrel Lodge Camping is a traditional Lakeland campsite on an 18th-century farm. Grassy pitches enjoy stonking great vistas across the adjacent fields to where the hills rise and fall, speckled with woodland like barnacles on a whale's back. There’s nothing formulaic about the welcome you receive though. Louise, Andrea and the three generations of family brought together to share the dream, are personable and friendly and just as in awe of the surroundings as most visitors. They can point you in the direction of each of the nine Wainwrights walkable from the campsite, as well as the nearest pub – a cosy little spot in Bassenthwaite with real ales on tap. It’s with fond memories that they too remember their younger days camping here and it’s clear they want to explore the surroundings of their new home as much as every guest. You almost feel guilty trekking off into the hills without them. The ethos, they tell us, is “small, quiet, friendly, traditional, but with nice hot showers, and somewhere to clean your boots and dogs.” And the result is the very antithesis of a holiday park. For proper camping with proper views, Kestrel Lodge should be top of the list. A traditional camping ground with a modern shower block, situated in a quiet corner of the Lake District National Park. Sitting in an enviable position, below Skiddaw with views across the valley to Bassenthwaite Lake, Kestrel Lodge Campsite is surrounded by some of the best fell walking routes in the country. 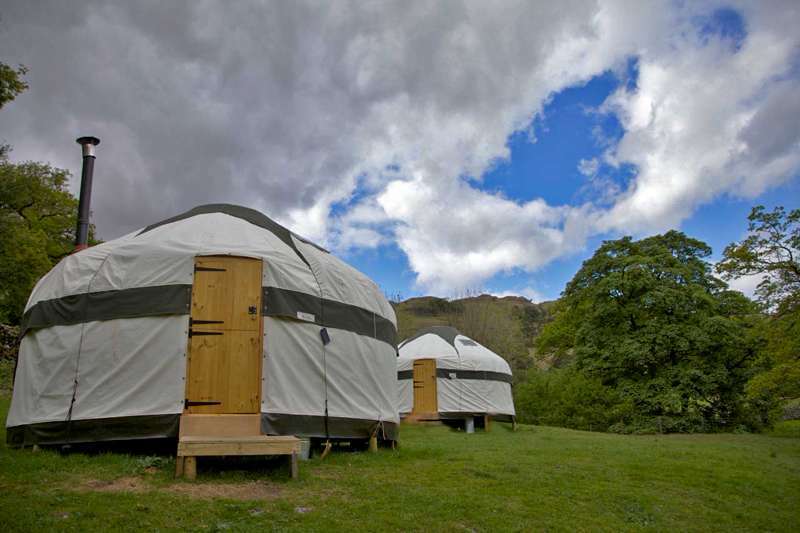 It’s a perfect base for exploring the Lake District and Northern Fells. Keswick and Cockermouth are within a 15 minute drive, where you will find a large number of shops, cafes, restaurants, and other attractions. Within short stroll away from the campsite is the village of Bassenthwaite, which has a great local pub, serving comforting hot food and traditional ale. Located off the beaten track yet within easy access of everything, you will feel like you are in the middle of the countryside, without being too far away amenities. For latest availability and best prices for Kestrel Lodge Camping, please use the Date Search above. 30 grass pitches, electrical hook-ups available. Newly refurbished toilet and shower block, covered cooking area, laundry facilities, a freezer for ice-packs, a small shop selling all the basics and Wi-Fi available. 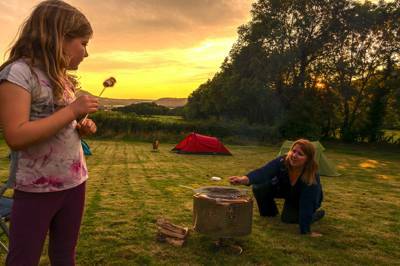 Campfires are allowed in the fire pits provided. There's a small flock of free range chickens. The Cumbrian Way footpath runs alongside the campsite. At the end of a good days walk from this campsite, you'll find yourself washing mud off your boots, mud off the dog and mud off the kids. All the hallmarks of a good day out in the Lakes. And a sign that this live-and-let-live campsite is well prepared for family campers. 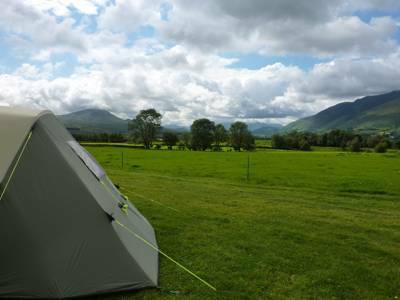 Skiddaw looms on the horizon and therefore gets all the glory but there are nine other mighty mountains that can be tackled from the campsite. It's around 5 miles to the summit of Great Cockup, a 7 mile walk up Binsey or take on the strenuous 11 mile loop that takes in Bakestall, Carlside, Longside, Ullock Pike and Skiddaw itself. Louise and Andrea can help you plan the route if needed. 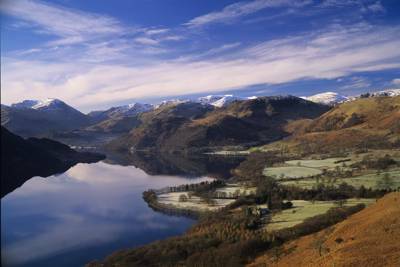 It's 6 miles to Keswick and 7 to Cockermouth, both full of excellent eateries, shops and museums that all prove there's more to the Lakes than just walking and cycling. Derwent Pencil Museum (017687 73626) in Keswick, Honister Slate Mine (017687 77230) and Wordsworth House and Gardens (01900 824805) are all good examples. There's a great pub in Bassenthwaite village, The Sun Inn (017687 76439), serving comforting pub food and with real ales on tap. It's a pleasant 20-minute or so walk (around a mile). £7–£9 per adult, £3.50–£4.50 per child (3–16yrs). 2-night minimum on weekends, and 3-night minimum on Bank Holidays and Easter. Under 3's and dogs stay for free. No extra charges for cars, gazebos, trailers, canoes, or hot showers. From Penrith; head on the A66 west towards Keswick. At the main Keswick roundabout take the 3rd exit, signposted ‘A591 Carlisle’. Stay on this road for approximately 5 miles, passing Dodd Wood, Ravenstone Hostel, and Bassenthwaite Church. Don’t turn off at the ‘Bassenthwaite’ sign, keep going another mile or so until you get to the signpost ‘Bassenfell Manor’. Turn right here and pass Bassenfell Manor (if you get to the Castle Inn you have gone too far). Keep going straight along this road for about 1 and ½ miles. You will see a sign on the left for ‘Kestrel Lodge Camping'. Take the unadopted road on the right for about half a mile until you arrive. From Carlisle; take the A595 towards Cockermouth until you get to Bothel. At Bothel take a left turn on the A591 towards Bassenthwaite and Keswick. About 5 miles down this road you’ll see the Castle Inn on your right-hand side. Take the 2nd left-hand turn after the Castle Inn at Bassenfell Manor Christian Centre. Keep going straight along this road for approximately 1 and ½ miles, until you see a sign on the right for ‘Kestrel Lodge Camping’. Take the unadopted road on the right for about ½ a mile until you arrive. From Cockermouth; take the A66 towards Keswick for about 6 miles. Just before you get to Bassenthwaite Lake turn left (B5291) and then first left again to continue on the B5291. Turn left over the Bridge and pass the Herdwick Croft Caravan Park. Stay on the road passing Armathwaite Hall, until you get to a ‘T’ junction at the Castle Inn Hotel. Turn right onto the A591, and then take the 2nd left towards Bassenthwaite. Keep going straight along this road for approximately 1 and ½ miles, until you see a sign on the right for ‘Kestrel Lodge Camping,’ take the non-adopted road for about ½ a mile. By Bus; there is a regular bus service from Workington to Penrith that passes along the main A591 and stops outside Bassenthwaite church just at the bottom of the village This bus also stops at the main Keswick bus station (Outside Booths). The campsite is approx. 1 mile from the Sun Inn (017687 76439) in the centre of the village. The bus service runs year round and daily exact times can be found here. The nearest train stations are Penrith, Carlisle, and Workington. By Foot; the site is located on the Cumbrian Way between Peter House Farm and Whitfield Wood. Kestrel Lodge is marked on Ordnance survey Maps, 1 mile from Bassenthwaite village. It can also be found off the footpath from the village, which passes Kestrel Lodge before joining the Cumbrian way.